Pre Order SuperNaturale's New Book: Craftivity! Have you heard of SuperNaturale? Shannon from Make It mentioned them yesterday here on decor8, but in case you missed it, SuperNaturale is an "independent site dedicated to the Do It Yourself culture in all its glorious forms. From simple afternoon home improvement projects to radical lifestyle choices - we love them all. We celebrate ingenuity, creativity and the handmade." In addition to their website, seems they are soon to celebrate something else, the launch of a new book, CRAFTIVITY ? 40 Projects for the DIY Lifestyle" by Tsia Carson. It hits bookstores in October, but you can pre-order it here for under $14. 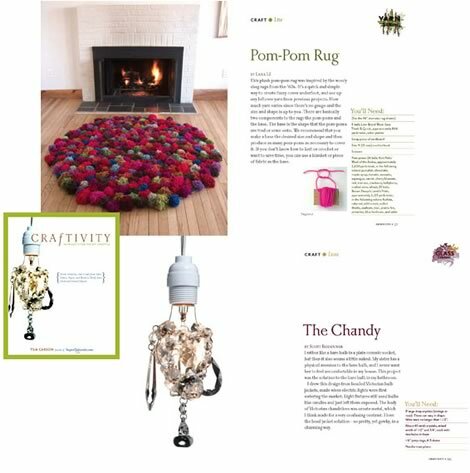 Craftivity is a giant project based book with loads of how to tips, fun DIY projects for your home, and many great gift ideas. SuperNaturale says "It is gigantic (224 pages! ), GORGEOUS, and chock full of information. Want to know how to crochet a skull? Want to spin yarn or felt? Want to make a platform bed but have no woodworking skills? Want to make your own money? Well, this is the book for you." - Easy to follow, step-by-step instructions and photos. - Lots of projects for the beginner as well as the seasoned maker. - Projects are actually fun to make. - Detailed explanation of techniques used?like knitting, stitching, woodworking, slip mold casting. - Showcases of inspirational work that expands the idea of D.I.Y. - Smartly designed and stunningly visual with photography and illustration throughout. Order yours today for under $14!